The Best Beaches in Costa Rica for your family vacation! Guanacaste, Central Pacific, and more! The list of Best Beaches in Costa Rica is lengthy; you won’t just find your run-of-the-mill sandy island beach here. Among all the tropical beaches in Costa Rica you will find white sand beaches, pink sand beaches, black sand beaches, clear water beaches, surfing beaches, swimming beaches, snorkeling beaches and more. Many of the beautiful beaches found in Costa Rica are perfect for families while others are great for nightlife, yoga, all inclusive vacations, hiking and wildlife. 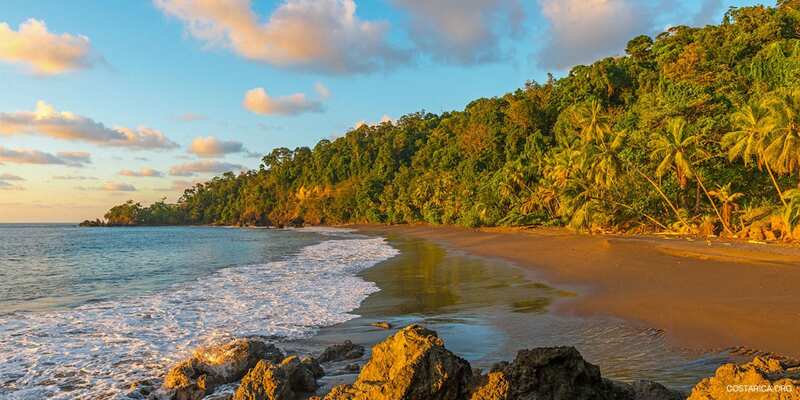 Most of the beaches in Costa Rica are connected to rainforests so if you’re visiting a national park, chances are you’ll find one of the following beaches! With over 800 total miles of gorgeous coastline in Costa Rica, you’re guaranteed to have a beautiful beach vacation! Hermosa beach is nestled within coastal hills in the Guanacaste Province that turn from green to brown during the dry season. The mile-long Hermosa Beach in Guanacaste is not to be confused with Playa Hermosa near Jaco. The Hermosa Beach in Guanacaste has mild ripples for waves and is a perfect swimming beach. Hermosa beach has less than half the crowds of its neighboring beach, Playa Coco. Tambor is another tranquil and relaxing beach close to a variety of all inclusive family-friendly resorts and smaller beachfront hotels. The placid Tambor Beach ocean is also known in Costa Rica for its mild temperature and calm waters. Contact our expert travel guides and set up your family vacation to Tambor! 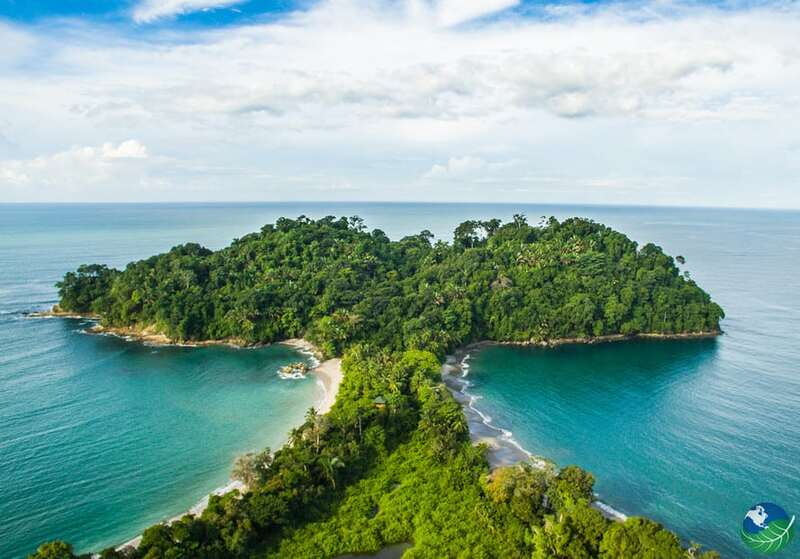 Manuel Antonio holds so much to be discovered by you and your family, this beach is located in the Central Pacific Region of Costa Rica. Relax at the beach after you walk through Manuel Antonio National Park! The perfectly shaped beaches are a great place for swimming and diving after you’ve explored the lush rainforest. Playa Conchal, true to its name, is made out of small broken shells and coral smoothed by the waves. Conchal is a good place to sit back and work on your tan or even go snorkeling. The turquoise waters is bustling with marine life and you will, without a doubt, spot the many tropical colored fish. You might even see the leatherback or Olive Ridley turtles that come to lay their eggs. Tortuguero National Park is a great place for the family. With a guide you can watch sea turtles come ashore and nest! It’s a once in a life time experience. Tamarindo Costa Rica in the province of Guanacaste is very lively; you will experience the best shopping and nightlife in the region not to mention the stunning white sand beach. If you’re looking for a good time, go to Tamarindo. Playa Tamarindo is in the middle of nowhere, located very close to the Liberia Airport. It is a great place to start y our vacation. When you think of nightlife in Costa Rica, Jaco is one of the best locations. Jaco is the closest beach to San Jose, so it is always full of tourists and locals enjoying the sun, bars and Imperials! Bars, and restaurants for everyone are spread across this lively beach. Check out the dance clubs and bars with live music and have a great time making new friends on your next trip to Jaco. The beach– Playa Jaco– is also great for surfing. Puerto Viejo is located on the Caribbean coast of Costa Rica and is great for more laid back travelers. The lively town lightens up after dusk; markets, and shops pop out of nowhere, and the streets become alive with activity. Watch some free entertainment as fire jugglers, and street performers come out. Puerto Viejo has many bars and restaurants serving different cuisines. You are sure to hear great Caribbean music–especially when the festivals come to town. From Puerto Viejo you can also easily visit Playa Cocles, Manzanillo or Cahuita, and the Gandoca Manzanillo Wildlife Refuge. Santa Teresa is one of the best beaches in Costa Rica for surfing. Known as the Hawaii of Costa Rica, Santa Teresa is situated on the tip of the Nicoya Peninsula. Everyone in this small area is either an artist or a surfer and surfing is an art in itself. The surfing here is unbeatable with high waves and plenty of curls. At the end of a long day out on the waves relax a bit put up your feet and sip on the many different kinds of beers the locals bars and restaurants offer. Playa Hermosa is known as a wild area to catch the best surfing waves. This local beach is never crowded so you’ll be sure to won’t share the waves with many other people. Visit this small paradise near Jaco and find yourself at the best spot on the beach to relax after surfing. Not far away are great locations for trying local cuisine and the popular swimming beach, Herradura. Not far from The Osa Peninsula and just south of Golfito Bordering Panama, Pavones Beach is a great surfing destination. This secluded area will bring you back to nature. Experience Pacific ocean waves and get to know some locals. Surfers come from all over the world to experience the surfing at Pavones Beach. Playa Grande is much different from the neighboring beaches in the area. It is considered a protected beach so you won’t find a lot of nightlife or hotels close by . However it is a great place for the aspiring surfers out there. Spend as long as you want on the endless waves rolling in. Relax in peace and quiet on this secluded beach and let all your cares float away. Caño Island blows all other destinations off the map when it comes to scuba diving. Located about 15 kilometers from the coast, you have to take a tour boat out to the island, but it is totally worth it. You will be astonished at all the marine life on this diving expedition. See Manta Rays, Dolphins, Whale sharks and an endless array of fish. The waters are clean and clear and give you a great underwater perspective to find as many fish as you can. Don’t forget your underwater camera. Playa Ocotal is one of a kind in the Best Beaches in Costa Rica category. The black sand and emerald green waters give this an otherworldly look. Scuba diving tour comes in all ranges here from amateur to expert. Even if you are just starting out, you’ll have a great time scuba diving with expert scuba diving teachers ready to help you get certified. You’ll see plenty of Manta Rays and other colorful fish. Not far from Playa Ocotal, Playa del Coco is very similar. Coco is another great beach for scuba diving. With clear water and few rocks, you’re sure to have a great time. It is also very close to many other beaches. Rent a car and visit several different beaches in one day! If you want some incredible snorkeling, go to Cahuita! It has the best coral reef in Costa Rica and famous for the world-class snorkeling. Explore the jungle and see monkeys and sloths before you take a dip in the calm waters and explore the underwater world!